Charter schools are tuition-free, open enrollment, public schools of choice.1 Unlike traditional public schools, which are governed by local boards of education, charter schools are governed by independent, nonprofit boards and are accountable to an authorizing entity, which may close them if they fail to meet the goals delineated in their charter contract. This arrangement gives charter schools greater autonomy than traditional public schools have in matters of curriculum, educational practices, staffing, and budget. In addition, charter schools often receive waivers or flexibility from a wide range of state and local education regulations. The role of charter schools in public education has grown immensely since the first charter school opened its doors in 1992. 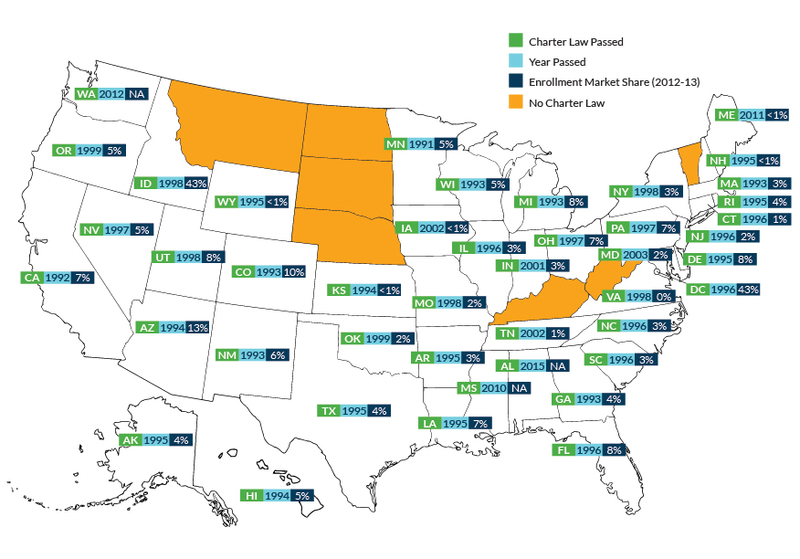 Currently, 43 states and the District of Columbia have laws enabling the creation and operation of charter schools, and more than 2.5 million children attend one of more than 6,000 charter schools across the nation (Figure 1). Proponents of charter schooling contend that this autonomy-for-accountability bargain leads to improved student achievement in individual charter schools by allowing schools the freedom to implement innovative practices and be held accountable only for their outputs. Further, charter schooling may produce improvements in the broader education system by creating an environment where schools must compete for students; to attract students, schools must maintain a high level of quality.2 And though results vary among schools, states, and student subgroups, on average charter schools achieve positive results relative to traditional public schools, particularly with traditionally underserved student groups. Accountability for charter schools takes the form of defined academic, organizational, and financial goals detailed in the charter, which is a contract between the charter school governing boards and authorizing entities. Authorizers approve (or deny) charter school applications, oversee schools during their operation, and make charter school renewal or closure decisions in the event of low performance.3 The types of entities that can perform authorizing functions vary by state. Most commonly school districts serve as authorizers, but state education agencies, colleges and universities, and independent organizations also serve in this role. State policies governing charters vary widely, in ways that affect both the supply and quality of charter schools in a state. This chapter will describe the growth of the charter school movement over time, evidence of charter school performance, the variability in policies related to school autonomy and accountability, and the role of management organizations in growing the charter school sector. This chapter also provides four case studies of cities exemplifying different trends—both challenges and successes—in charter schooling. Specifically, a case study on Boston highlights how restrictive charter school caps can impede the growth of a high-quality charter sector; a case study on Denver illustrates the potential and challenges of district-charter collaboration; a case study on New Orleans describes how a city can embrace chartering and alternative governing structures to bring about improved opportunities for students; and a case study on Washington, D.C. illustrates how a well-developed city ecosystem can support a large charter market share. Evidence on the quality of charter schools is mixed. In general, the most rigorous studies find that charter schools deliver better academic results compared with traditional public schools, particularly for traditionally underserved student groups. However, there is a great deal of variation in charter school performance; impacts vary by student subgroup, school type, and geography. Some individual cities have also developed exceptionally high-performing charter sectors (see Sidebar: Cities With High-Performing Charter Sectors). Washington D.C.: Students attending charter schools in Washington, D.C. achieved 72 more days of learning in reading and 101 more days of learning in math compared to students attending the local district schools. Boston: In Boston, low-income black and Hispanic students acquired more than a year’s worth of additional learning in both math and reading compared to students in Boston Public Schools. New Orleans: Black students attending charter schools in New Orleans acquired 58 additional days of learning in reading and 86 additional days of learning in math than their peers in traditional district schools. Not all charter sectors produce such positive results, however. In fact, some sectors produce results that are on the whole worse than traditional district schools. Of the 27 states analyzed by CREDO, 14 produced negative gains for students in math compared to district schools; nine produced negative gains for students in reading. Nevada’s charter schools demonstrated the worst overall performance, with charter students learning the equivalent of 108 fewer days in reading and 137 fewer days in math compared to their traditional public school peers. Even within states with low-performing charters overall, the quality of charter schools varies. In Ohio for example, where the charter sector has been struggling with poor student achievement results for over a decade, charter schools in Cleveland are producing positive learning gains for their students in both reading and math, compared to students attending traditional district schools in the city.22 In Ohio in particular, the Cleveland School District has been a willing participant in partnering with a high-performing charter management organization, Breakthrough Schools, to ensure that these charter schools have the autonomy and accountability, as well as the access to financial resources and school facilities, necessary to produce high-quality results. The kind of quality monitoring and district-charter partnership happening in Cleveland is largely absent from Ohio’s other major cities. Despite strong evidence for success on average and in some communities, not all charter schools or sectors ultimately improve students’ learning opportunities. In some cases, charter schools perform at or below the level of traditional public schools; some are run so poorly that they close mid-year, leaving hundreds of students in search of a new school. The success of charter schooling depends on an array of factors at the system and school level. System-level factors include the way the law is written, which regulations are or are not required, the structure of authorizing and financing, and the quality and integrity of data reporting. School-level factors include the strength of school leadership and teaching, organizational management, access to adequate facilities, and appropriate funding and budgeting. A 2011 report by the Center for Education Reform (CER) analyzed more than 1,000 charter school closures nationwide since 1992. The report found that 42 percent of charter schools close due to financial reasons; 24 percent close due to mismanagement; and 19 percent close as a result of poor academic results. Lack of facilities, district obstacles, and “other/unknown” issues account for the remaining 15 percent of closures. Ultimately, these results suggest that charters have an overall positive impact on students, particularly among groups of traditionally underserved students. But wide variation in results across student subgroups, school type, and geography across the charter sector remains. This variation suggests a need to better understand the factors that lead to success in some schools and for some students in order to reduce the number of low-performing schools and increase the number of high-performing ones. The charter school theory of action is based on a belief that reducing regulatory restrictions imposed on traditional public schools allows flexibility to drive innovation, potentially leading to improved student outcomes. As such, charter schools operate under a much less stringent regulatory environment in which results matter but inputs do not—charter school leaders and teachers have the freedom to run their schools and classrooms as they see fit, and are held accountable only for their students’ academic outcomes. 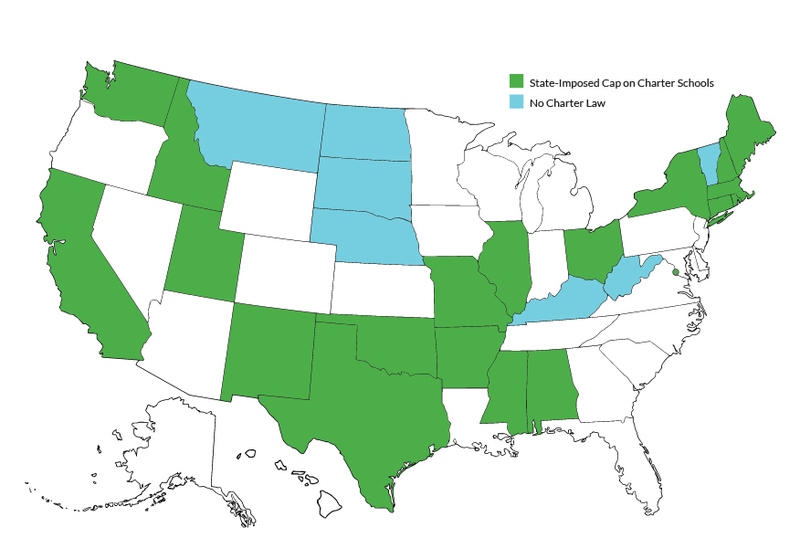 Despite the promise of greater autonomy, many state and authorizer policies limit the amount of freedom that charter schools actually experience. State-imposed constraints are most common in the realm of teacher certification. For example, more than 90 percent of charter schools are required to abide by state teacher certification requirements to some degree. In addition, more than 40 percent of schools face restrictions from state laws in the areas of charter contract revisions (the inability to make changes outside of renewal) and staff compensation (including requiring schools to participate in the state retirement systems). Charter schools experienced the fewest restrictions in the areas of work rules for staff, school scheduling, procurement policies, program and curriculum, and staff dismissals.24 Approximately 90 percent of schools experience broad autonomy in these areas under state charter laws. Many authorizers impose additional constraints on charter schools, beyond state law, through their contracts with the schools. Although these contracts vary widely among authorizers, there are several notable trends. The most commonly cited area for additional authorizer-imposed restriction is in school discipline. Most of these restrictions originate from district authorizers requiring charter schools to adopt district codes of conduct. Additionally, more than 15 percent of schools reported facing restrictions from authorizers in the areas of budget, procurement, board compensation, and management contracting. In spite of the variability in regulatory contexts, overall charter schools do operate in a significantly less regulated environment than traditional public schools. But regulatory autonomy is only half of the equation. To make the autonomy for accountability bargain work, charter schools must face credible consequences for failing to meet the performance goals stipulated in their charters. School closure is the ultimate consequence when a charter school persistently fails to meet its academic, organizational, and/or financial goals. Closing a persistently underperforming school can be challenging, however. In some cases pressure or resistance from community politics or from parents, students, and staff make school closure decisions contentious.27 Further, in some communities, there may be no, or too few, better options available for students of the closed school. Closing a school can also be expensive, as funds must be transferred and vendors paid. States have begun to address these issues through two primary avenues: enacting automatic closure laws and increasing the accountability of authorizers for the performance of schools under their charge. Minnesota, for example, passed legislation in 2009 that clarified authorizers’ responsibilities and gave the Minnesota Department of Education (MDE) regulatory authority over authorizers, allowing for evaluation and sanctions for poor practices. The law requires all authorizers — both existing and new — to apply to the MDE, and to submit to review by the MDE every five years, and the law gave the MDE the authority to revoke authorizing rights from any entity not meeting expectations. The state of Ohio is in the process of implementing a new authorizer accountability framework that imposes consequences for poor practices. Beginning this year authorizers will be ranked based on three components: the academic performance of the students in charter schools they authorize; adherence to “quality practices” aligned to NACSA standards; and compliance with applicable laws regarding charter school authorizing.36 Low-performing authorizers can be prohibited from authorizing new schools, or have their authorizing authority revoked entirely. Ultimately, the autonomy-for-accountability bargain only works if charter schools are held accountable for meeting the goals defined in their charters. This accountability can be addressed through automatic closure laws, or by adopting policies to ensure that only high-potential schools are authorized and that authorizers are held accountable for the schools under their authority. Other policies, such as implementing strong performance management systems, strong standards for charter school renewal, regular evaluations of schools, and high operating standards and transparency for authorizers, can also help to support an environment of strong accountability. To aid authorizers in adopting high-quality practices, NACSA has developed a set of recommended Essential Practices (see Sidebar: NACSA’s Essential Practices for Charter School Authorizers). Independent chartering boards (ICBs), also known as charter schools “commissions” or “institutes”; these entities are statewide bodies whose sole purpose is authorizing charter schools. LEAs can be strong authorizers. This is especially true when the district embraces chartering as a tool to create high-quality schools and provides resources to support the growth of chartering. In these cases the local district can be the charter sector’s strongest ally and can supply charter schools with access to critical resources such as facilities and transportation. But heavy reliance on LEA authorizers can be problematic, especially if they are the only authorizing option in the state. States in which this is the case often have very little authorizing activity. LEAs may lack the incentives to be active, high-quality authorizers, lack the capacity necessary to oversee charter schools, or view authorizing functions as a burden.38 39 They may also have a fundamentally different understanding of charter schooling. For instance, districts may view opening charters as a means to add innovative programs to the district, more like a magnet school model, which accepts students across traditional school boundaries and offers a particular program (like a focus on arts or sciences). The difference is that magnet schools remain under the authority of the school district governance structure, whereas charter schools are independently operated public schools.40 Finally, local school boards may view charters as competition and may unduly reject applications. Further, allowing varying entities to authorize schools can lead to a proliferation of authorizers, which can reduce the overall quality of authorizing. Research has found that economies of scale matter; authorizers that oversee at least five schools are more likely to have the capacity to perform their authorizer functions well.43 These authorizers are more likely to offer appropriate training and support to their staff members and to acquire the resources required to adopt best practices.42 States with dozens of authorizers are more likely to have many entities overseeing a small number of schools. A proliferation of authorizers can also create a system where schools can evade closure by engaging detrimental behaviors such as authorizer hopping (where low-performing schools switch authorizers to avoid contract termination). Once a charter has been issued, the governing board is responsible for ensuring that the school has what it needs to operate — including necessary financial resources, personnel, and materials. For comparison, these functions are more typically managed at the district level in a traditional school district by a school board or superintendent. In some cases, a governing board hires a school management organization to take on some of these responsibilities and manage the school’s day-to-day operations. Nonprofit school management organizations are called charter management organizations (CMOs), and for-profit school management organizations are called education management organizations (EMOs). The board signs a management agreement with the CMO or EMO detailing the specific tasks for which the management organization is responsible. Charter management organizations (CMOs) are non-profit organizations that operate multiple charter schools. The CMO concept emerged as a way to scale the success of high-performing charter schools. In addition, by pooling certain academic and operational functions across multiple schools, CMOs can achieve operational efficiencies that stand-alone schools lack. Outcomes-based focus: Success of the organization and team is measured entirely on the academic achievement of its students. Freedom to innovate: School management organizations are free to structure their programs in the way they see best fit to meet the learning needs of their students. High performance expectations: A performance-driven culture is a hallmark of many school management organizations and informs recruitment, selection, and development of teachers and leaders. Embracing data to drive performance: Student achievement data is used to drive decisions across the organization. Schools at the center: The organization is built from the classroom and school level “up,” versus from the top down. Decisions made closest to students: Principals and teachers have autonomy to make key decisions for their students, including decisions about budget allocations, curriculum, and student discipline policies. Efficiency: Principals have authority over their school’s budget, ensuring that funds are spent to directly address the unique needs of that school’s student body. There are over 130 CMOs in the United States serving 250,000 students.55 While some CMOs are very large, operating dozens of schools serving tens of thousands of students, many are relatively small, operating fewer than five schools serving just a few hundred students. Just 20 CMOs serve 5,000 students or more. Some CMOs serve students in grades K-12, while others focus exclusively on a particular grade range, such as middle or high school. While some CMOs operate nationally, many focus in particular states or communities. For example, the Knowledge is Power Program (KIPP), the oldest and best known CMO, is actually a network of 26 distinct regional charter management organizations that collectively serve 59,000 students. Depending on state law, CMOs may operate multiple schools under one charter or obtain separate charters for each school they open. CMO leaders spend a great deal of time defining and creating their culture. Phrases like “high expectations,” “college for certain,” and “no excuses” have become hallmarks of many high-performing urban CMOs. The models described below are not mutually exclusive, however they attempt to describe the culture, expectations, and/or curricula of popular charter school models. “No excuses” charter schools, such as those operated by KIPP and Uncommon Schools, hold students to high behavioral and academic expectations; they often have strict disciplinary codes that value consistency, and acronyms that help students remember key expectations (for example, SLANT, stands for “sit up, lean forward, ask questions, nod yes and no, track the teacher”). College-prep charter schools such as Aspire, Green Dot, and Achievement First focus on creating a college-going culture. From a young age students are exposed to the expectation that they can and will attend college; students complete a college-preparatory curriculum. Blended or personalized learning charter schools such as Rocketship and Carpe Diem use technology to differentiate lessons and ensure that all students are learning at their own level. CMOs also vary in academic performance. While some CMOs outperform comparable public schools, others do worse. In a 2012 study of CMOs, nearly half had positive impacts on student performance in both reading and math, but 18 percent had negative impacts on both subjects (the rest had either no significant impact or had positive impacts in one subject area and no or negative impacts in the other). The magnitude of impacts also varied widely among CMOs. The average CMO had a positive, but not statistically significant, impact on students’ performance in reading and math. Higher performing CMOs tended to be larger and serve more students than the lower-performing CMOs, in part because high-performing CMOs received more support to grow or expand. The percentage of charter schools operated by charter management organizations has increased rapidly over the past 15 years, from 12 percent of all charter schools in 2000 to 20 percent in 2010–11.62 63 Based on the most recent data, roughly one-fourth of all new charter schools opened are operated by one of the two types of management organizations, the majority of those CMOs. Several factors explain the growth of CMOs and their increasing market share. First, philanthropic funders, viewing expansion of high-performing CMOs as a promising way to increase the supply of quality school seats for low-income students, have invested significant resources to accelerate the growth of high-performing CMOs. Second, existing CMOs often can launch new schools more quickly than new operators starting from scratch because they have an existing educational model and staff capacity to support the creation of new schools. Finally, authorizers and policymakers have made changes to policies and practices to support charter school growth. When policymakers first drafted charter laws and authorizers began approving schools, they assumed most charters would be individual, stand-alone schools. As a result, charter laws and authorizing practices designed for single schools started from scratch sometimes created obstacles for CMOs seeking to grow or replicate. Over the past five years, authorizers in some states have created new approval processes for CMOs seeking to replicate, distinct from their process for brand new schools. And some states have enacted policy changes that support CMOs, for example, by allowing multiple schools to operate under one charter. In the coming years, CMOs will likely continue to play an increasing role in driving the growth of the charter school movement. But CMOs also face significant obstacles as they grow. Human capital, in particular a limited supply of highly skilled leaders for new schools, is perhaps the biggest obstacle constraining the growth of high-performing CMOs. Difficulties in obtaining facilities also block growth in some communities. More fundamentally, as more CMOs seek to grow to even greater scale, many face challenges in maintaining quality. While some CMOs have managed to maintain and even increase quality, others have seen declining quality in new schools. To maintain quality during growth, CMOs must establish central infrastructure, systems, capacity, and supports to ensure quality across ever-larger numbers of schools. In addition, as some CMOs seek to grow to new geographic areas beyond those where they were founded, many are learning that the models that worked in one community or state may not transfer perfectly to new contexts; a successful transfer requires building community relationships and connections, as well as, in some cases, adjusting aspects of the model to match the funding levels, cultural norms, and student and family needs of a new community. Scaling high-performing CMOs is now a major strategy for improving overall charter quality and increasing students’ access to high-performing schools. But it has its own risks and limitations, which CMO leaders, funders, and policymakers must acknowledge when scaling high-performing models. EMOs perform similar functions to those of CMOs, but they generally charge a management fee for their services.65 EMOs too have been instrumental in charter sector growth. In 1995–96, five EMOs operated six schools serving approximately 1,000 students nationwide. By 2011–12, 97 EMOs operated 840 schools serving nearly 463,000 students in 35 states across the country.66 Four states — Michigan, Florida, Ohio, and Arizona — have more than 100 EMO-run schools. EMOs have captured much of the virtual schools market. These schools deliver instruction entirely or almost entirely online, accounting for 11 percent of all EMO-managed schools in 2011–12. But because of their significantly larger enrollments than what traditional brick-and-mortar schools have, virtual schools accounted for more than 30 percent of all students in EMO-operated schools. (CMOs, on the other hand, managed just 16 virtual schools, accounting for only 1.3 percent of all CMO-managed schools and just 1.7 percent of CMO student enrollment during the same year.) Out of the 73 EMO-operated virtual schools open in 2011–12, 63 were operated by just five large EMOs: Connections Academy, K12 Inc., Leona Group, Mosaica Education, and White Hat Management. Like any other education innovation, CMOs and EMOs are not a silver bullet. Quality varies both across and within organizations, and both CMOs and EMOs face a number of external challenges. However, in some cases, they can and do provide students greater learning opportunities. In addition to laws and policies regulating the accountability structure of charter schools as described above, state laws also have important impacts on charter schools’ operating conditions. The laws that govern charter school funding and growth are of particular importance. Little has changed in the last decade. A recent analysis of 30 states and the District of Columbia found that funding disparities between charter and district schools grew more than 54 percent between 2003 and 2011.72 In FY 2011, charter schools on average received $3,500 less per pupil than district schools, a difference of 28 percent. State-level disparities between average district and charter school per-pupil funding ranged from 0.1 percent in Tennessee (meaning that, on average, Tennessee charter schools receive slightly more per-pupil funding than district schools) to -58.4 percent in Louisiana (meaning that on average Louisiana charter schools receive less than half the per-pupil funding that district schools receive). State school finance systems frequently provide discrete funding for particular expenditure types, separate from general operating funds (see Chapter 3: Financing Our Public Schools). Often, funding for facilities and transportation services are among these discrete allocations. In many states, charter schools do not receive the same allocation of funding for transportation or facilities that traditional public schools receive. In fact, only 21 state charter laws address the issue of transportation funding. Eight require the local school district to transport at least some charter students; 13 require the state to provide funding for transportation equivalent to what traditional district schools receive.74 The remaining state charter laws are silent on transportation funding. If charter schools in these states wish to provide transportation to their students, they must dig into their regular operating funds, which are already less per student on average. In addition to funds for operations, every state provides some funding to help traditional school districts with facilities in some form or fashion — primarily through grant or reimbursement programs (in some cases these funds are targeted or restricted to lower wealth school districts).76 In addition, traditional districts can access subsidized financing programs for facilities construction such as bonds. Bonds are a form of debt financing, which must be approved by voters who agree to an increase in property taxes to fund the debt service associated with a given construction project. Proceeds from the sale of the bonds pay for the construction of school facilities. The state may subsidize bond financing by supplementing local tax revenue for debt service and may also guarantee bonded debt with state assets, which can help schools qualify for more favorable rates. Although charter schools do not commonly have bonding authority and typically cannot directly access local tax dollars, some states allow school districts to include charter school facility needs in their bond or levy requests. Evidence suggests that this rarely happens, however.78 The vast majority of states also allow charter schools to access tax-exempt bonds or loans to use for facilities, and a growing number of states have laws giving charter schools the right of first refusal on any district facility that goes up for sale. Despite these programs and policies however, access to facilities remains a key challenge for charter schools. On average, significant funding inequity exists between charter schools and traditional public schools. Charters frequently begin with less revenue per student and then must spend significant portions of those funds on transportation and facilities — necessary functions for which traditional district schools often receive separate funding allocations. Many states have imposed caps on either the number of charter schools that can exist or the number of students who can attend charter schools. Proponents contend that caps help limit the growth of the sector, and thus control the overall quality of charter schools (by encouraging authorizers to be more discerning in approving applications and more rigorous in closing low-performing schools).79 On the other hand, opponents argue that charter school caps stifle the growth of high-quality schools and may deter high-performing operators from even applying to operate in the state. Twenty states and the District of Columbia set some type of cap on charter schools.80 81 These policies vary significantly, however. For example, some states place geographic restrictions on where charter schools can open. Others limit the number of schools that can open in certain cities and/or across the state; and others limit the number of schools certain types of authorizers can open. Still others limit the percentage of a district’s total population that can be enrolled in charter schools. In some cases state caps are sufficiently high that they do not inhibit the growth of the sector in practice, while in other places caps have restrained the growth of the charter sector. The city of Boston (see Case Study: Impact of State Charter Caps in Boston, Massachusetts) is a prime example of how charter school caps can limit the growth of high-quality charter schools. Because of the potential for these caps to restrict the growth of high-quality charter schools, the National Alliance for Public Charter Schools (NAPCS) recommends that states not restrict the number of charter schools, their enrollment, or the locales in which charter schools can open. If caps exist, however, the NAPCS recommends that their design allow adequate room for growth.82 Some states have implemented “smart caps” that limit the number of new charter schools that can open, but allow schools with a demonstrated track record of success to be exempt from the cap and to expand and replicate more freely. The environments in which charter schools operate vary dramatically from state to state and even among cities within a single state. To help guide policymakers in developing strong policy environments to allow high-quality charter schools to flourish, the NAPCS has identified 20 components of a strong charter school law (see Sidebar: Components of a Strong Charter School Law). Formal laws and policies are only part of factors shaping charter school operating environments. Other elements including the strength of state and local leadership, strength of school leadership, the availability of support organizations, the availability of philanthropic funding, the supply of human capital, and the availability of facilities dramatically affect charter school operations. The following examples illustrate how these policies and broader environmental factors influence the charter sector in particular cities. The city of Boston, Massachusetts has one of the highest performing charter sectors in the country, yet it also has one of the nation’s most restrictive charter caps. It offers a prime example of the challenge that restrictive charter school caps pose to the growth of high-quality charter schools. The city of Denver, where 39 charter schools served nearly 14 percent of the city’s public school students in 2012–13, offers an excellent example of how successful district-charter collaboration can support the growth of a quality charter school sector. Hurricane Katrina devastated the city of New Orleans and wiped out much of its school facilities, but the process of rebuilding it provided what then-Governor Kathleen Blanco called a “golden opportunity” to remake the entire school system. And the city did just that, using chartering as a model to overhaul the system and create improved educational opportunities for its children. The steps D.C. has taken as its charter sector has grown offer important lessons and guidance for cities to ensure that their growing charter sectors are fully folded into the city’s education system. New York City offers a striking illustration of the difficulties charter schools face in accessing facilities.